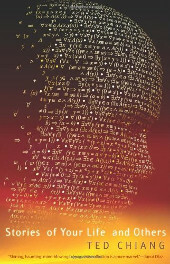 Finding an author like Ted Chiang is a rare occurrence. A writer who speaks not only to you personally but also serves to illuminate the works of others, revealing hidden depths you would never have stumbled across in works you’ve cherished for years. Chiang’s almost miserly output – a mere 14 short stories and novellas over more than two decades – cuts right to the core of the sci-fi genre, revealing its beating heart in all its imaginative glory and adding a shot of adrenaline for good measure. To have only discovered him now pains me. To realise that in finishing this collection I have depleted over half of his catalogue is unbearable. But at least I can do my best to tempt you to join me in the ecstasy. Stories Of Your Lives And Others covers a bewildering variety of styles, subjects and eras. The collection’s opener for instance, Tower Of Babylon, thrusts us not into the future but the Biblical past. We join a team of miners on their journey up the mythical tower, learning the secrets of its constructions from fellow labourers as they go. Why would miners of all trades be required at the peak of this greatest of all monoliths? Because the vault of Heaven has finally been reached and mankind is ready to break through to the world of gods. The action takes place at a meditative pace, steadily ascending as the mechanics of this universe slowly reveal themselves. However, the gods of whom they are in pursuit seems mightily conspicuous by his absence. The story’s twist ending is pitched perfectly and will have you smiling and contemplatively stroking your beard (where applicable) for a time afterwards. And so it is with the remainder of the stories. There’s a wonderfully novel mash-up of the time travel genre with the Arabian Nights style of story-telling, multiple story-lines and time-frames wrapping around each other to dizzying effect. I lifted the quote at the start of this review from a remarkably touching tale of a robot making the momentous discovery that his universe is approaching the equivalent of the entropic heat death which awaits our own. There’s the incredibly poignant and moving tale of a loving partnership in the process of disintegration, told through the lens of a terrifying mathematical discovery in Division By Zero. Yes, maths can be terrifying, trust me. Hell Is The Absence Of God drops us into a world where it’s taken for granted that Heaven, Hell and angels all exist – they’re there to be empirically verified by whoever cares to look. Given this premise, Chiang embarks on a study of blind faith versus rational investigation, managing to avoid appearing condescending to believers while still wielding his scientific skepticism like a scalpel. And there’s the titular Story Of Your Life, of particular interest to the language teachers among us. Here Chiang grants us a unique twist on the first contact story, with alien lifeforms arriving on our doorstep and calmly awaiting communication. However, unlike other tales of this ilk, there is no universal translator available. Instead we join a linguist tasked with learning an alien language from scratch, painfully aware that we have not evolved to discern the sounds made by our visitors’ physiology and with an almost entirely unrelated written language to contend with. All the while the story is framed by an apparent series of letters to her daughter, speaking of events past as though they yet awaited in the future and leading us towards the time-twisting conclusion. There’s nothing I’d like more than to get into a detailed discussion of each and every tale within these pages. They all merit extensive examination and there’s barely a wasted word anywhere. However I’ll simply leave it to you to find out, for the pleasure will be all the greater when you get there. I will say this though; if you care at all about science fiction, creativity, intellect and masterful writing then you would do yourself an enormous disservice by ignoring Ted Chiang.